Dealer Lead Track guides your staff to obtain essential customer information ensuring each customer contact becomes a quality lead. On the simple to follow lead capture screen, the staff member collects important basics: full name, best contact phone numbers, eMail address, and selects which advertising source is responsible for the lead from a drop down list that you manage for advertising tracking. By getting this basic information during the initial contact, your sales staff now takes control of every incoming customer lead. What vehicle is your customer interested in? Dealer Lead Track then directs the salesperson to select from drop down lists the exact vehicle which the customer is inquiring and to indicate if the unit is in stock. Noting the correct year, make, model, trim, and mileage gives your sales staff better product knowledge. If the sales person chooses the ‘Not in Stock’ option, the lead will still be captured and added to the ‘Not in Stock’ report. Your inventory buyer can access this report to locate the exact vehicle for which that customer is interested. Not just selling automobiles? Dealer Lead Track has the capability for staff to manually input exotic vehicles, recreation vehicles or RV’s, motorcycles, scooters, boats, jet skis, trailers, heavy equipment, aircraft and more with our manual input feature. When are you looking to make your purchase? 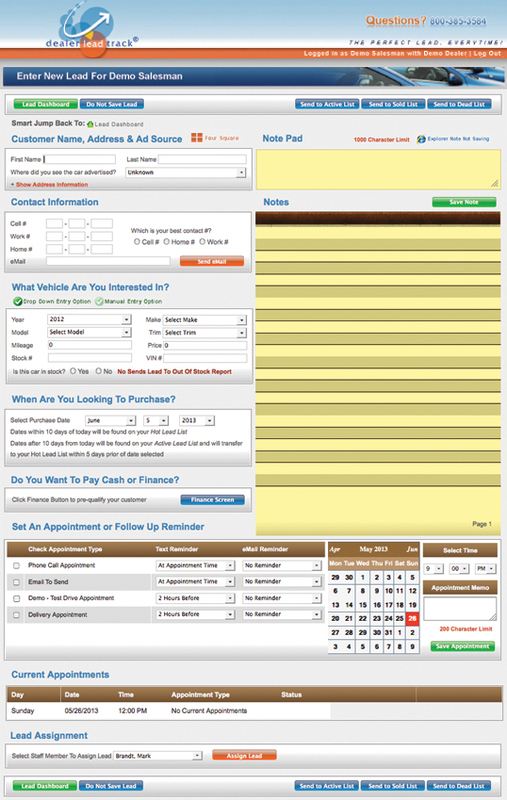 Dealer Lead Track makes sure your sales staff follows up with customers at the right time by prompting a simple question: “When are you looking to make your purchase?” Customers looking to purchase within the next ten days are considered “Hot Leads” and are prioritized to receive extra attention from your staff. If customers purchase time frame is more than ten days in the future, the staff member selects a date from a drop down list which places the lead on the ‘Active Lead List’. Five days prior to the selected future date, the lead will move back onto the ‘Hot Lead List” so staff can follow up at the exact time your customer is ready to buy. Set appointments with customers for follow up phone calls, emails, test drives or delivery appointments. Dealer Lead Track will remind staff about upcoming appointments by text message or eMail so staff never forget about customer appointments. Transfer single leads to other staff allowing simple transfer of customer information when staff will be out of the store or off the day of appointment. Dealer Lead Track's single lead assignment option is perfect for stores which a receptionist answers the phone, collects the lead and then can transfer to proper sales person. Link multiple stores with Dealer Lead Track and assign customer leads to staff at the proper location. Our multi store feature is perfect for stores utilizing a BDC call center format. Dealer Lead Track continues the lead flow by advancing into the deal structure. Does the customer want to pay cash or finance? What down payment does the customer have available? Recording this information helps staff start to structure the deal. 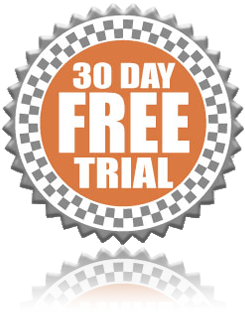 Dealer Lead Track logs the year, make, model, trim, and mileage of any trade to continue control of the sales lead. Dealer Lead Track takes the next step in the trade process by capturing past loan and payoff information. Dealer Lead Track concludes capturing of a new lead by prompting the sales staff for the customer's opinion of his or her credit status. By obtaining the customer’s view, staff can begin to determine the deal structure. Why Is It Important For Staff To Gather Proper Customer Information From Every Lead? Dealer Lead Track will guide your staff to properly collect and manage customer lead information from initial contact throughout the entire sale leading to increased sales. So How Well Do You Think Your Sales Staff Work Your Leads? Click the red details button below to find out. Dealer Lead Track helps improve your closing rate, target marketing dollars with solid real time advertising data, and follow up with customers when they are ready to buy. Accomplish all this with Dealer Lead Track's easy-to-use web-based customer management system. Dealer Lead Track will not change your sales process. We enhance your sales process improving the performance of all sales staff leading to increased sales. Sign Up Now!